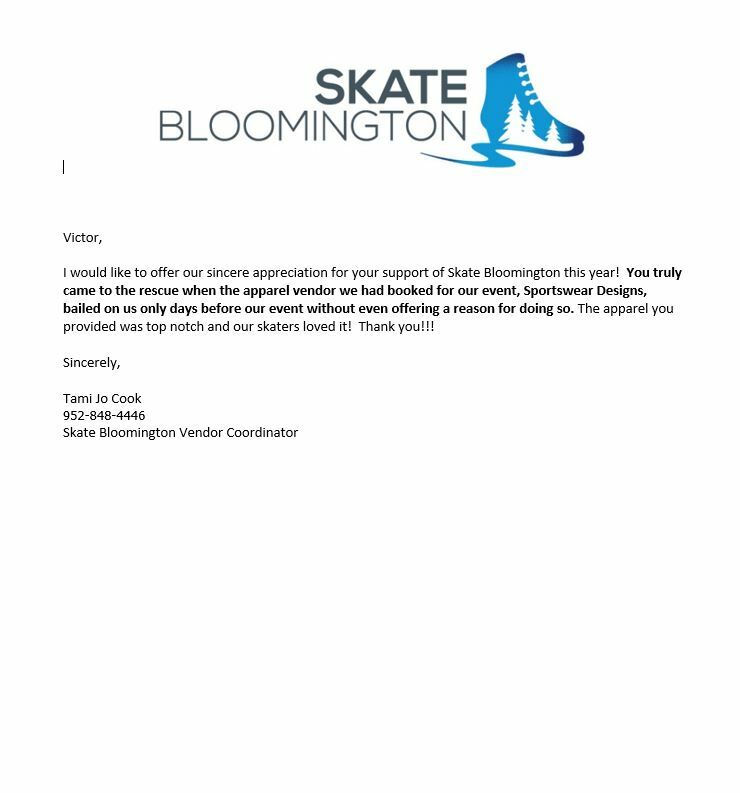 I would like to offer our sincere appreciation for your support of Skate Bloomington this year. The apparel you provided was top notch and our skaters loved it! The service again this year was Excellent. 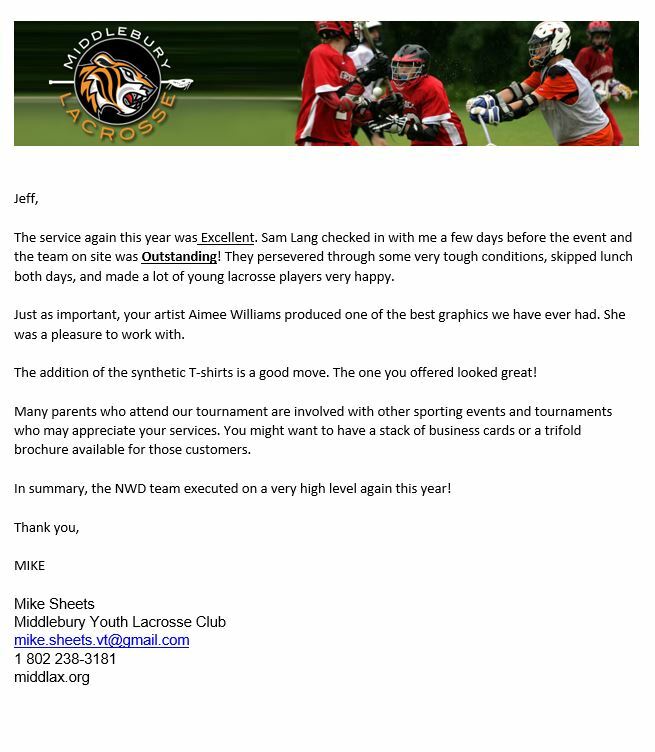 Sam Lang checked in with me a few days before the event and the team on site was Outstanding! They persevered through some very tough conditions, skipped lunch both days, and made a lot of young lacrosse players very happy. Just as important, your artist Aimee Williams produced one of the best graphics we have ever had. She was a pleasure to work with. We appreciate the Northwest Designs willingness to come all the way over to Maui and provide the same quality and quantity of merchandise as one would expect at a similar event on the Mainland. NW Designs also provided the t-shirts that were given to our volunteers for the meet and donated a substantial amount of additional shirts for MAGSA to be able to give to those volunteers who put forth exceptional effort and time. 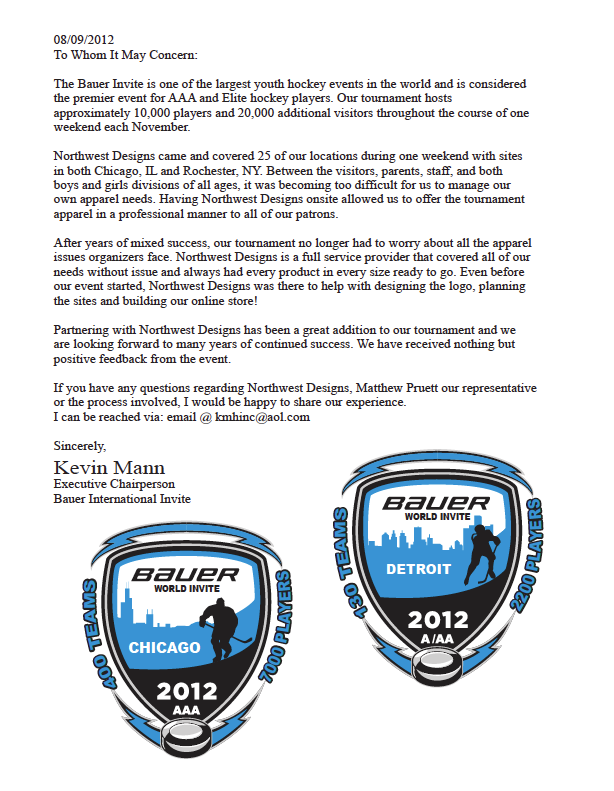 It was a pleasure to work with Northwest Designs! 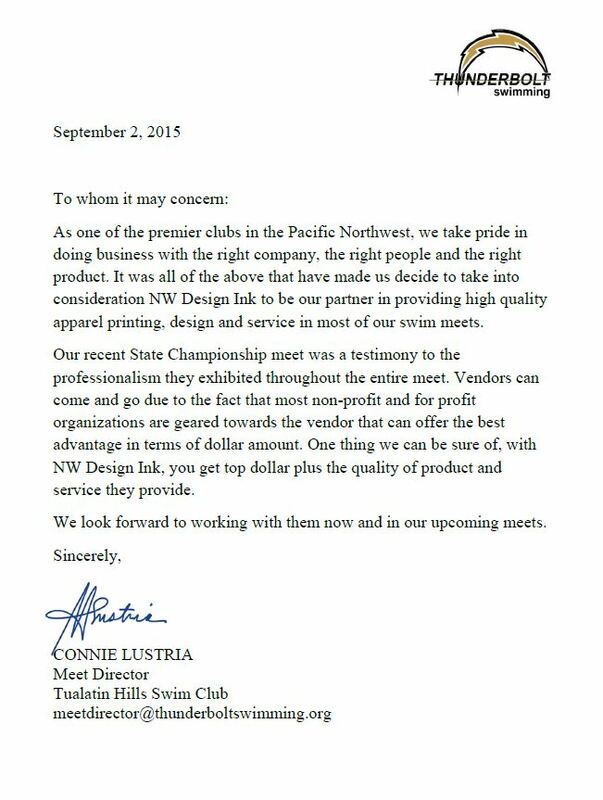 ...Northwest Designs arrived at our venue early to set up and were ready to sell as the first swimmers arrived. They designed a great logo for our shirts and we received positive feedback from the swimmers, parents and coaches. We look forward to doing business with them this season as well! 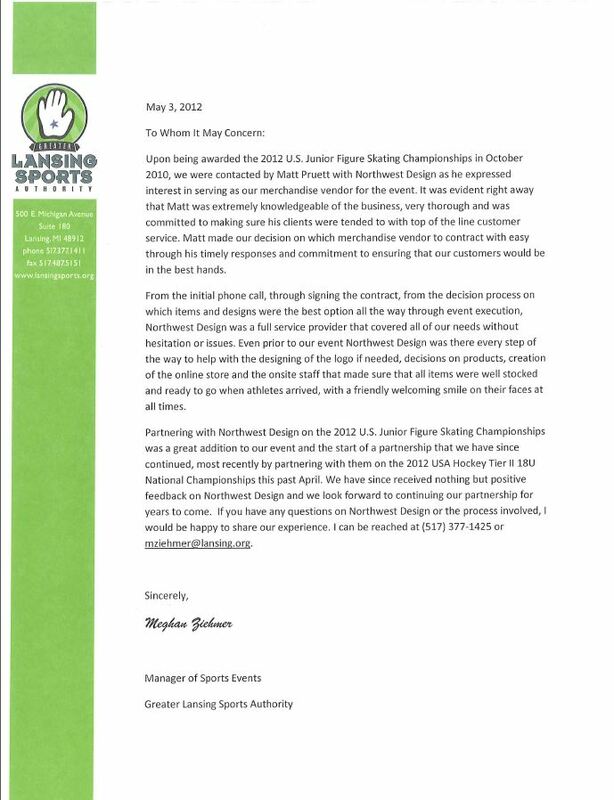 Northwest Designs continues to provide high-quality products, excellent customer service throughout the entire process and their staff is so easy to work with. 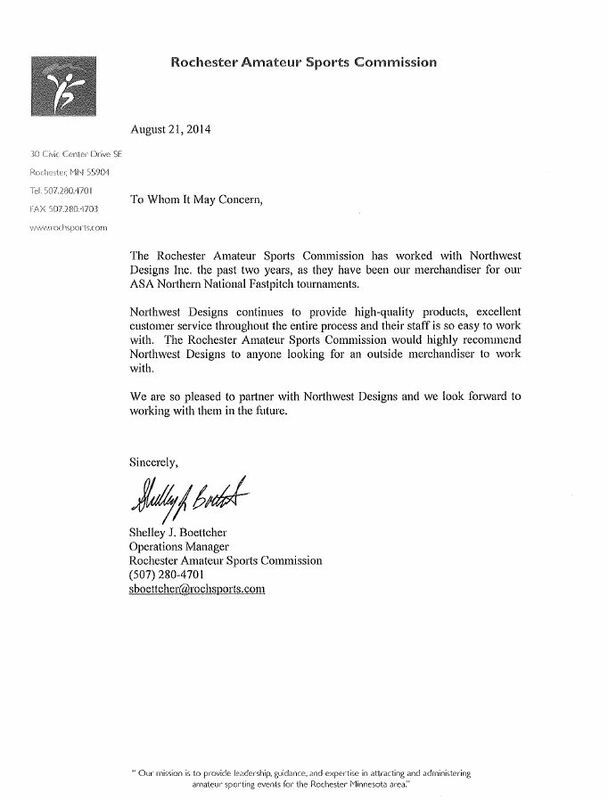 The Rochester Amateur Sports Commission would highly recommend Northwest Designs to anyone looking for an outside merchandiser to work with. Our office has been overjoyed using Northwest Designs! They are very accommodating to our needs onsite or prior to events. Sales have grown each year because of our partnership. 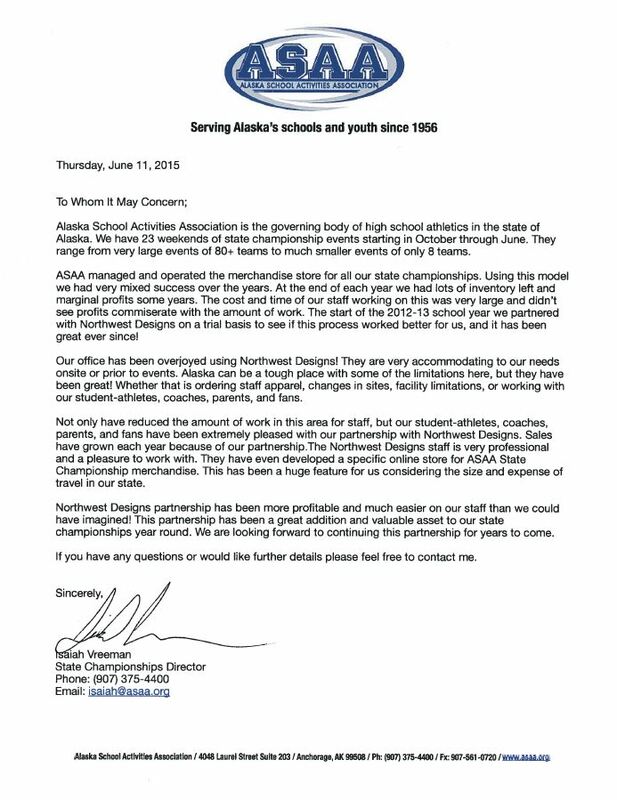 They have even developed a specific online store for ASAA State Championship merchandise. We are looking forward to continuing this partnership for years to come. Your staff works tremendously hard prior to the event to help is with artwork and other set up items. After the event, your accounting department is fat with the commission checks. I would recommend your company for any swim meet as custom apparel provider. 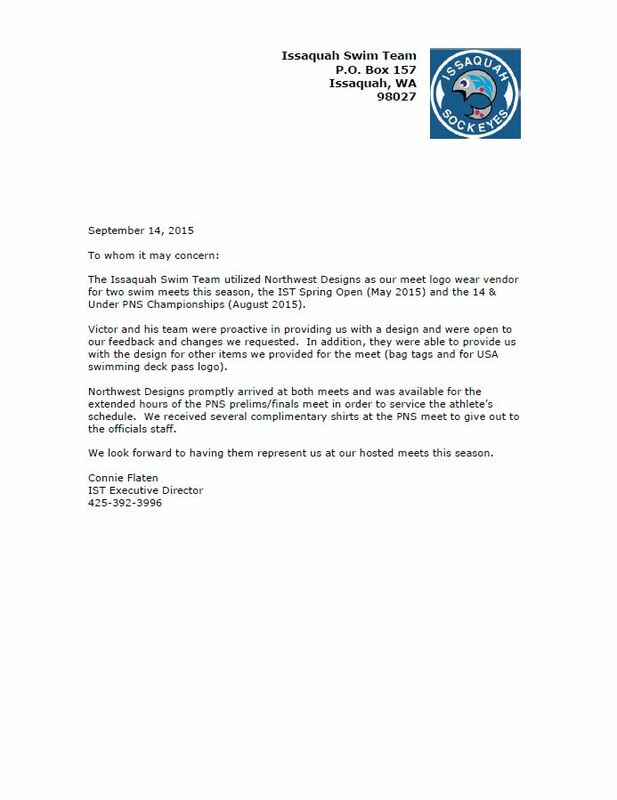 Northwest Designs promptly arrived at both meets and was available for the extended hours of the PNS prelims/finals meet in order to serve the athlete's schedule. We received several complimentary shirts at the PNS meet to give out to the officials staff. We look forward to having them represent us at our hosted meets this season. 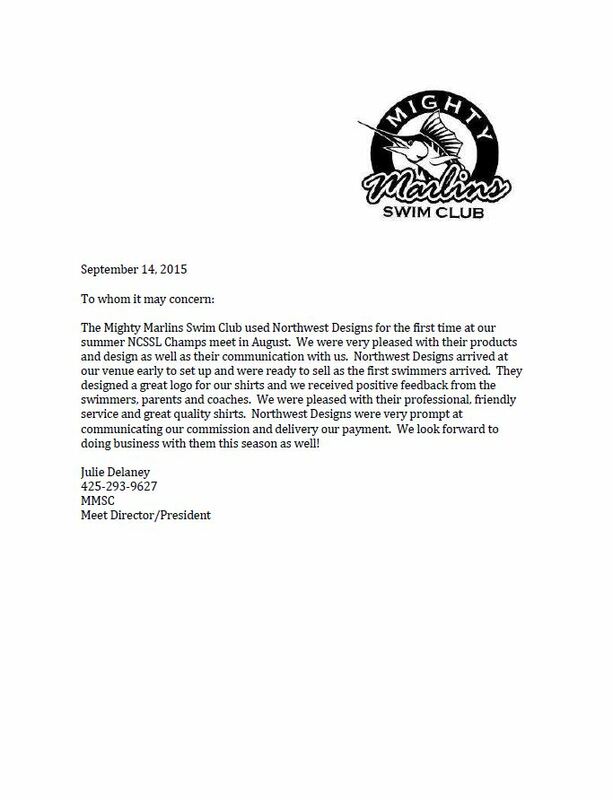 NW Designs has been a great partner to our swim team. They listen to their customer, and stand behind their product and service. 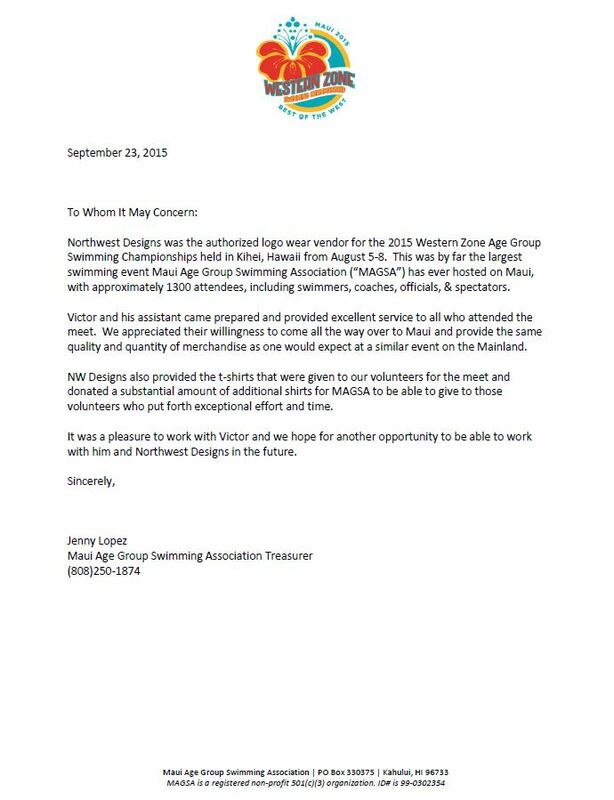 NW Designs has the professionalism and ability to take care of the largest swim meets. 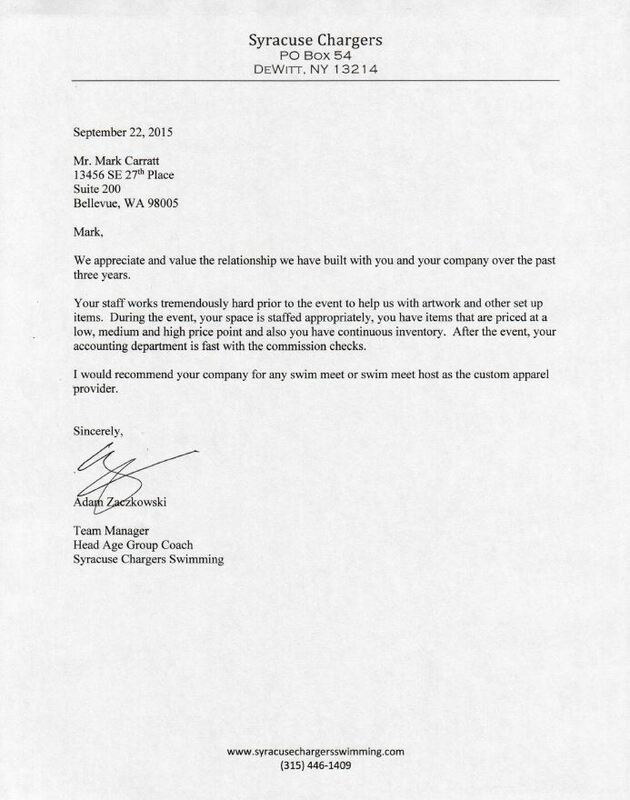 I would recommend NW Designs to any team… What better way to be a team, then by working like a team. We take pride in doing business with the right company, the right people and the right product. One thing we can be sure of with NW Designs Ink, you get top dollar plus the quality of product and service they provide. 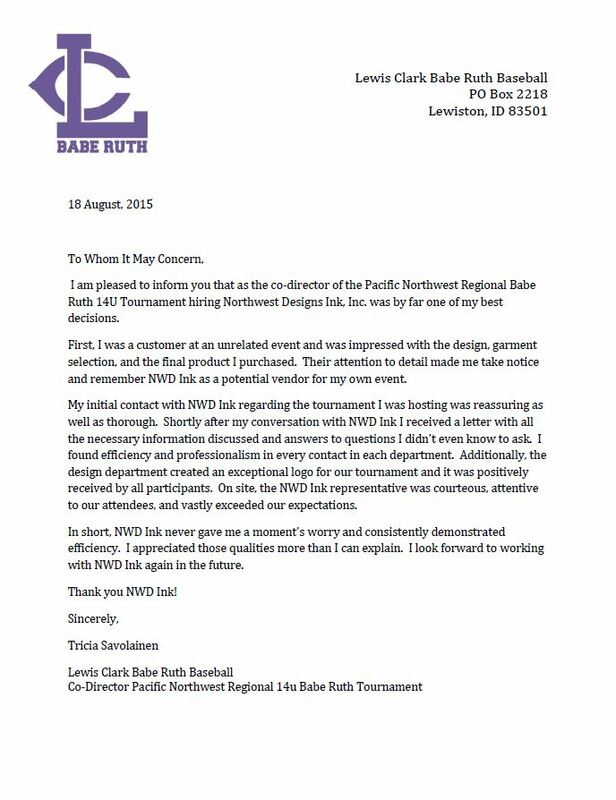 I am pleased to inform you that as the co-director of the Pacific Northwest Regional Babe Ruth 14U Tournament hiring Northwest Designs Ink, Inc. was by far one of my best decisions. The design department created an exceptional logo for our tournament. On site, the NWD Ink representative was courteous, attentive to our attendees, and vastly exceeded our expectations. NWD Ink never gave me a moment’s worry and consistently demonstrated efficiency. I look forward to working with NWD Ink again in the future. Northwest Designs Ink, was selected as the official merchandise provider for the 2015 WPFG. When we selected NWD to be our merchandiser we knew we would be getting a great Games Merchandiser; but we did not expect a true PARTNER for our event… It was an absolute pleasure working with NWD… I would recommend NWD to anyone who is searching for a merchandiser for their event. Northwest Designs Ink provides personal, custom, high quality merchandise done right! Once the tournament started, Northwest Designs had sales pavilions at all three soccer complexes that were properly staffed, loaded with a wide assortment of t-shirts from plain white to tie-die's and everything in between. They are reliable, professional and in the end they exceeded all of our expectations. Everything you did for us and with us was - without question - 110 percent perfect. 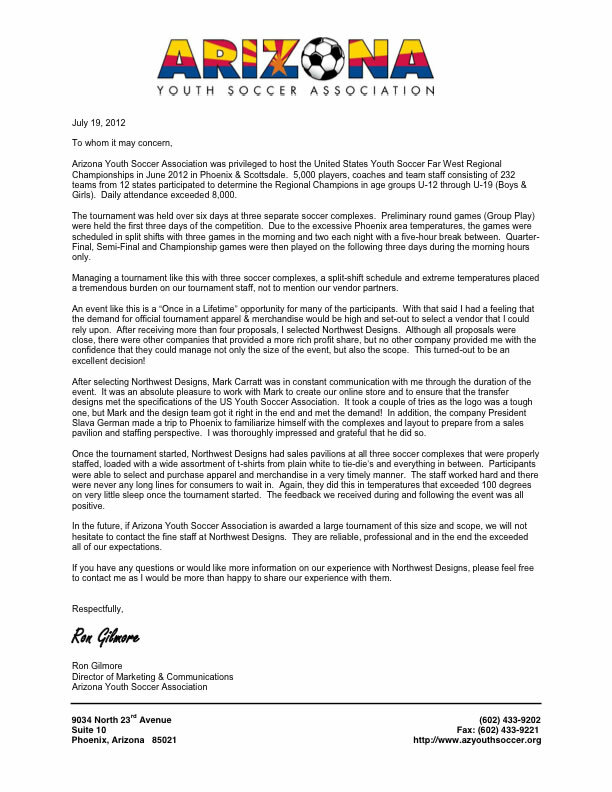 From a creative standpoint, Northwest Designs delivered on that end as well. Your staff was terrific. 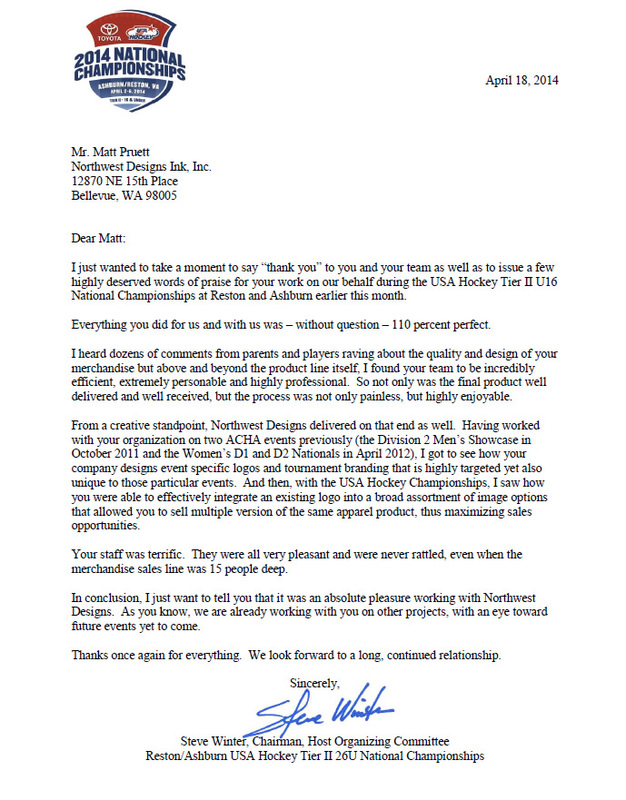 It was an absolute pleasure working with Northwest Designs. 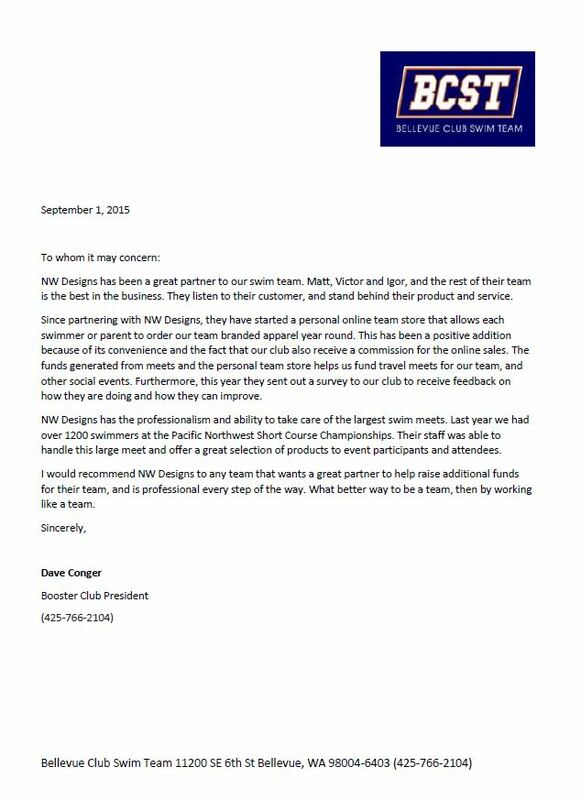 Partnering with Northwest Designs has been a great addition to our tournament and we are looking forward to many years of continued success. We have received nothing but positive feedback from the event.